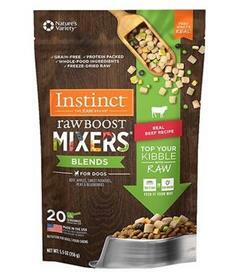 With Instinct by Nature's Variety Freeze Dried Raw Boost Mixers Blends Grain-Free Natural Beef Recipe Dog Food Topper, you can top your dog’s kibble with raw nutrition! A delicious way to add excitement to every meal, this food topper is made with whole-food ingredients like real beef and apples, sweet potatoes, peas and blueberries—all 100% freeze-dried so it’s bursting with flavor and nutrition. And you can feed it your way—simply use it dry as a topper or rehydrate as a meal to add vibrant fruits and vegetables to your pal’s bowl. Ingredients: Beef, Beef Kidney, Beef Spleen, Beef Liver, Apples, Sweet Potatoes, Peas, Pumpkinseeds, Blueberries, Tricalcium Phosphate, Montmorillonite Clay, Carrots, Butternut Squash, Salmon Oil, Potassium Chloride, Cod Liver Oil, Salt, Yeast Culture, Dried Kelp, Cranberries, Zinc Proteinate, Mixed Tocopherols (for freshness), Vitamin E Supplement, Manganese Proteinate, Rosemary Extract.